Former staff past and present have lamented the loss of a daily-turned-weekly after its last print issue was published. 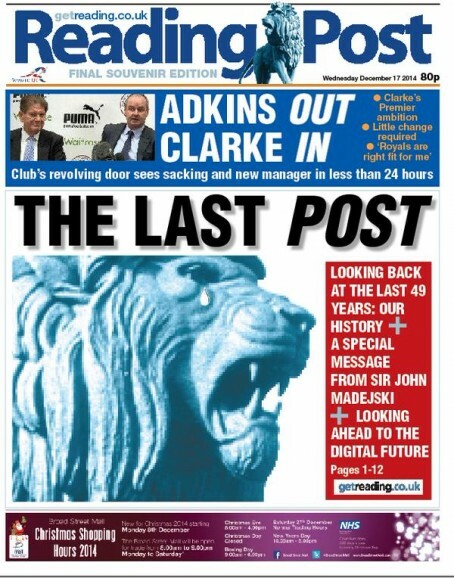 Articles inside include a look back at the paper’s 49-year history and a farewell message from Reading Football Club chairman Sir John Madejski. Sir John paid tribute to the “wonderful” staff who had put the “show on the road” through the years. He said: “The Reading Evening Post touched us all, a friend dropping in – it had everything for everybody from the cradle to the grave and of course all the local gossip, the worthy, the good guys and the bad guys, the winners and the losers, the sports results and everything about Reading Football Club. The Evening Post was launched on 14 September 1965, billed as the most technologically advanced paper in the country. Its revolutionary new £1m printing press was the world’s first computer-controlled system, with an increased printing speed of 30 per cent on old methods. It switched from a daily to a weekly in 2009, at which point it also dropped the ‘Evening’ from its name. Former women’s editor June Green, who married the Post’s first editor Howard Green, described the decision to close the title as a “tragedy”, while Keith Townsend, who oversaw the camera operators during the Post’s early years and recalled 350 staff working at its Tessa Road building in its heyday, said he was “gobsmacked”. Trinity Mirror, which closed the title along with sister title GetReading and five others across the south of England with the expected loss of 50 jobs, is now pooling resources into a ‘digital-only’ initiative based at its website www.getreading.co.uk. The project will be led by the company’s digital development editor Ed Walker. In an editorial in the last edition of the Post, he said: “The challenge remains the same – we need to tell the stories which matter, to the people who need them but the change is the speed of delivery at which this now takes places. “The average adult in the UK who owns a smartphone (such as an iPhone) unlocks their phone more than 100 times a day, and by early 2015 the percentage of adults with a smartphone is set to pass 80 per cent. “Look under the Christmas tree this year and you’ll find another explosion of iPads, Kindles and various other tablets waiting to be unwrapped. “We have to ensure getreading is one of those key places people turn to when unlocking their phone, be it for a quick catch-up on the latest news or an in-depth read on the issues affecting our town. “Reading has always been at the forefront of technology and so has the Post. It was the first to embrace colour printing and developments in newspaper production technology.